The foundation single crochet (fsc) is a stitch that can replace the foundation chain and the first row of single crochets in your work by completing them at the same time! This is also known as chain free crocheting!!! 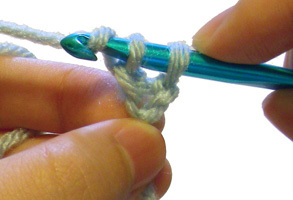 Often times crochet foundation chains are tighter than the rest of the work, but with fsc it will have the same tension without having to use a larger hook. With some yarns (such as boucle) it is hard to see the stitches in a traditional foundation chain, but with fsc you don’t have to crochet on a chain. Even if you prefer making a traditional foundation chain. You can use fsc to add extra stitches to your work without having to take the whole thing apart if you accidentally miss count the number of chains. It’s faster if you do it right! Being able to complete a chain and a row of single crochets at one time can save you time. 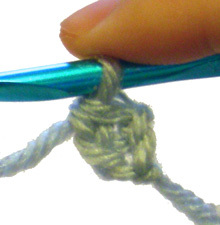 Here is a picture tutorial for making the foundation single crochet. This tutorial is for both right and left handed people. For left handed pictures, roll your mouse over the image and it will change for you. 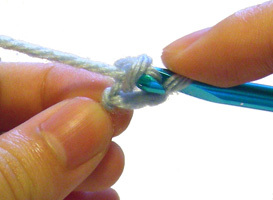 Step 1: Start with a slip knot on your hook and chain 2. Step 6: pull the strand of yarn though one loop on your hook (you should now have 2 loops on your hook) Note that you just completed the chain portion of the stitch. Step 8: pull the strand of yarn though the final 2 loops on your hook (you should now have 1 loop on your hook) Note that you just completed the single crochet portion of the stitch. 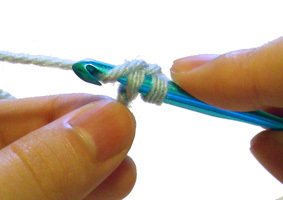 Step 9: Insert your hook under the 2 loops of the “chain” portion that was made in the previous stitch. It should seem like your hook is between the chain and the single crochet. It may be easier to see where to insert your hook if you hold your work sideways or upside down. 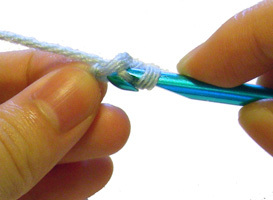 Repeat steps 3 – 8 to complete the stitch. You can make a row as long as you desire. This will replace the foundation chain and first row of single crochets in a piece of work. Here is what a row of fsc looks like! If you need help with making a foundation single crochet, let me know and I’ll love to help! This entry was posted on Friday, June 26th, 2009 at 3:30 AM by Rachel Choi	and is filed under Tutorials and Help. You can follow any responses to this entry through the RSS 2.0 feed. You can leave a response, or trackback from your own site. Hi Lila, you can work the fhdc until you reach the number that you need. Then on the last fhdc, make a slip stitch into the bottom of the first fhdc you make, then work the fhdc, then make another slip stitch into the top of the first fhdc. Rachel, I was looking for information about how to count the stitches in a foundation single crochet, and I found this blog. Like the original commenter, Lila (Oct.27, 2013), I am making fingerless gloves, and wondered how to join the foundation chain back to the beginning. I LOVE you idea about making the connection using a slip stitch at the bottom and again at the top, with a regular stitch in the middle, but I’m not sure where to start the regular stitch: in the same place as the bottom slip stitch, IN the bottom slip stitch, or someplace else entirely? How are all of these stitches counted in the pattern? Thank you SO much for your help. You will start the last stitch just like the other foundation stitches. If you are using fsc like in this tutorial, they you will work step 9 to start your next fsc. Then work step 3 – 6. Then make your slip stitch into the bottom of the beginning stitch. Then finish your fsc with steps 7 and 8. Then make a slip stitch into the top of the beginning stitch. When a pattern calls for “chain 124. Then dc in fourth chain from hook…” do you fdc 121? The pattern has no multiple listed. Yes, the 121 fdc would be equivalent. I was working on a pattern that is worked in multiples of 5. I like using chainless foundation. the pattern called for ch 100, in 4th ch from hook dc, this counted as the 1st 2 dc sts… It did not look right. Question… can I do chainless foundation st to 96, ch 4 & put that dc st in the 96th chainless foundation stitch?? Thanking you in advance for your attention to this inquiry and any help you may give me. I’m not sure what your second row is, but if it starts with a ch 3 and it counts/acts as a dc, you would skip the first fdc. Thank you very much for this, I have been crocheting for 60 years and did not know this until I found your site. I saw several and yours was so clear to follow. Hi Tina, sorry I don’t think there’s a way to redo the chain without undoing it. If there was a way, I wish I knew too! You could undo the slipknot and pick out each chain, but it would be pretty tedious. You would also need another piece of yarn or something like a circular knitting needle or a crochet hook on a flexible cable to hold your stitches until you work them back into the rest of your project. Yes, thank you. i knew i’d need to support everything else with yarn or something , but what stitch should i use to reconnect it all back together? I would slip stitch in the base of each stitch. i have been a knitter all my life and only ventured into crocheting last year… my 66th! now because of your so helpful tutorial, i shall go forth and multiply— those foundation stitches. and maybe tackle bigger projects, which i used to look at enviously. so happy to have met you thru your blog. I am trying to make a ribbing…fsc…but, I need to change colors as the ribbing will have a stripe. I have had several false starts….the combination of the the colors is fsc in A (4) B (2) A(3) (Combo of 9) I am having a time switching the colors…the yarn is either too taut or two loose..any pointers? Im trying to make a baby blanket. After i single foundation 45 chains do i turn my work? Do i single crochet the top or the bottom? This is first time doing a single crochet foundation and making a baby blanket out of the single crochet foundation. You will turn your work and work the next row on top of your foundation, as if you were making a row of single crochets on top of another row of single crochets. I am really having a hard time with this foundation stitch. I can get as far as the first stitch and its completion. Then I have no idea where to insert the hook to make the next one. All videos I have watched go so fast that I cannot see where to make the second stitch. They then show a series of stitches and mine does not look like yours. Help please. I’m in the middle of a pattern, row 26 and it says make 24 fsc. Do I use the previous row as my chain? Working the stitch into it? I’m confused as to how I would connect to the previous rows. Any help would be appreciated. Hi Shannon! From your description it sounds like the fsc is going to stick out next to the row you already made. It will look like an extension of the row you are working on. To start the fsc, you can use the side of the last stitch you made, but it may vary depending on the pattern. Ok! Thank you so much! The pattern itself is a little confusing and this spot was something I couldn’t figure out. I think I have the stitch correct, but my fsc row is coming out curved and not at all straight. That seems to defeat the purpose. What am I doing wrong? 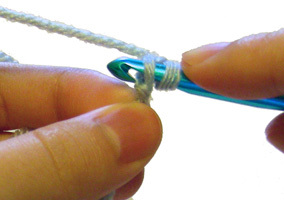 Try making the chain part (step 4) of the stitch slightly looser. Also you can try and double check that you are inserting your hook into the correct spot (step 9) when you are starting each stitch. Sure am glad I have your site to turn to for answers to my crocheting questions! I found a pattern for a shawl that I really want to make. Is it basically a fsc? It is a bit different than a fsc. The fsc is like a row of chains with a row of single crochets on top. For the pattern that you are looking at you’ll be creating a long row of chain spaces. Ok if I need a multiple of 3 plus 2 chain what do I fsc? First row is sc into second chain from hook. Next row chain 3 for dc. The fsc will count as the beginning chain and the first row of single crochets. So you will work row 2 next. I did the fsc and it looks great. The problem is its is twisted in a spiral. When I continue with several sc rows it’s ending up curved…like the lower edge is tight. I did a small swatch and crochet about 5 rows and the curvature is less but still there. Help! Hi Jane! It sounds like the chain portion of the fsc is too tight. Try making that part of the stitch looser so that the tension in the stitch is more even. I thought this looked familiar. I use this stitch to make lanyard necklaces. 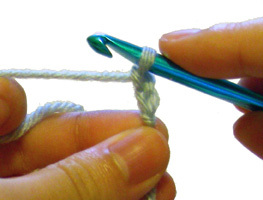 This stitch was recommended for the first wrist row for fingerless gloves. Easy directions to follow. Thanks Rachel. I’m learning this crochet technique and I wonder how to count the stitches? You can count them in the same way you count other stitches. At the top of each stitch you should see a “v” shape. You can count those v’s to see how many stitches you have. Try counting as you crochet, make 10 or so stitches and see if you can count the 10 v’s. Hi Cara! 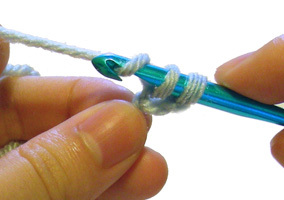 Yes, it can be used to replace any first row of all single crochet stitches. For the linen stitch it usually has chains in the first row (sc, ch, sc, ch, etc.) so it would be tricky to use the fsc for that, unless you plan to do the first row as all sc without the chains. I am just learning this type crocheting. Thank you! There definitely less roll. I thought I was doing something wrong. Now I know that it happens to other people too. Great tutorial! I really like using the foundation chain to begin projects. It keeps them from pulling and puckering. Thanks so much for sharing! 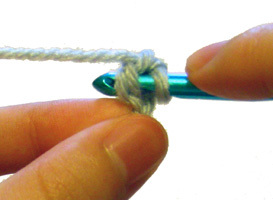 This is the clearest, best tutorial on this stitch I found…and I tried 3 or 4 before I read yours. Thank you for making it easy to understand! After completing the foundation chain, how can you tell which is the front of the chain? The hook will be towards the top side when you are done.